Outlin'd By Jhunjhun Jain is a zero-waste brand that does bookmarks, coasters, trays and more home decor all made out of cork. Also, all their products carry intricate Jharokha, Minar and arch designs that are a tribute to India's stunning architecture. A four-year-old brand, Outlin'd's products celebrate India and its architecture. The person behind this brand, Jhunjhun Jain, transforms detailed designs of overhanging balconies, silhouettes of the Hawa Mahal, the Char Minar and more into functional products. 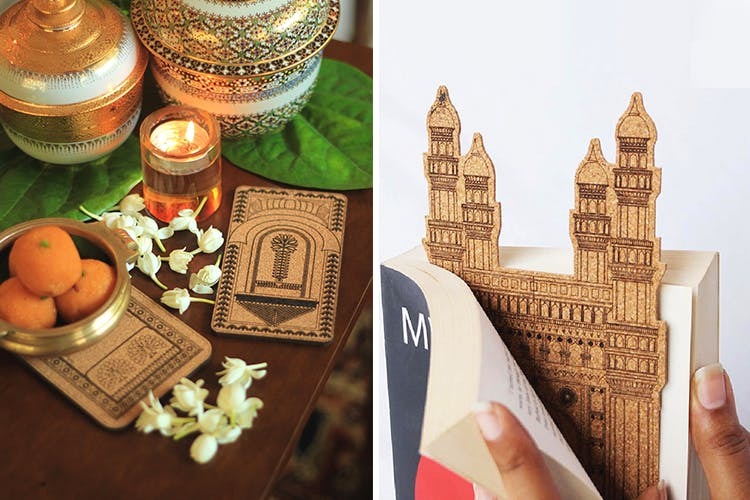 From fancy-looking wine trays and intricate coasters to lock-shaped bags and bookmarks that'll make you want to read, this company does it all. For those who're heading to a house-warming party or just want to be nice and make someone feel special (look at those stunning placemats! ), Outlin'd will have your back. What's also great about this company is that their designs are engraved onto the cork and not printed on them. So don't worry, the designs won't fade away for generations. We wish they would offer more options for all their products and add more items to their catalogue eventually. Use a damp cloth and a mild cleansing solutions to clean all of Outlin'd's products.